Tibet travel tips, a choice of destinations also combinable as tailor-made individual holidays in Tibet. 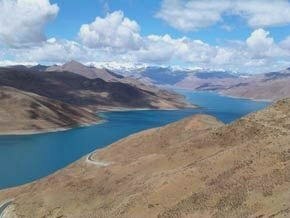 We do arrange customized travel to Tibet, cultural journeys, adventure travel and trekking tours in Tibet as well as Tibet pilgrimages and jeep safaris around Tibet. Visit the sacred sites of Jorkhang and Potala, walk with the pilgrims the Kora along the Barkhor or around the potala, and discover the fascinating monasteries of Sera, Drepung and Ganden. Enjoy the atmosphere of this very special place. Accommodation varies from family run guest houses to atmospheric and comfortable hotels. I recommend getting ro Lhasa by plane via the large cities of mainland China or via Kathmandu. Another option would be the train-ride from/to Chengdu or Beijing. Sacred cities, monasteries tainted by atmosphere and history, and a stunning nature. 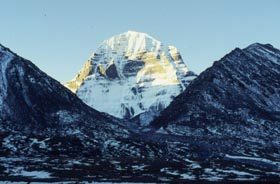 ♦ 02 - 03 days - Excursion north to Namtso Lake and Reting Gompa. 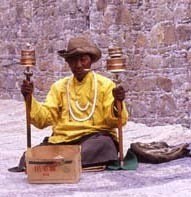 ♦ 02 - 03 days - Excursion to Samye, Tibet's first monastery, to Tsetang and the Yarlung valley, Tibet's Valley of the Kings. ♦ 05 days - Visit Tibet's oldest monastery at Samye, explore the Yarlung valley, the craddle of Tibetan civilisation, climb the Kumbum at Gyantse and enter the Tashilhunpo Gompa (home to the Panchen Lama) at Shigatse, before returning to Lhasa. ♦ 07 - 08 days - Same as above with continuing to Sakya Gompa near Lhatse and to Everest Base Camp North before returning to Lhasa. Taking a flight from Kathmandu/Nepal is definitely the most convenient. After spending a few days in Lhasa, cruise through Tibet's heartland taking in most of the historic sites, cross the mighty Himalayas and reach Kathmandu in the lush valleys of Nepal. ♦ 04 - 06 Tage - Travel overland along the route Lhasa, Gyantse, Shigatse, Sakya, Nepali border, Kathmandu. ♦ 05 - 07 Tage - Same as above with excursion to Everst Base Camp North. ♦ 04 days - The classic age-old trek between the important monasteries of Ganden and Samye south-east of Lhasa, crossing 2 passes around 5000m. ♦ 04 days - Hiking between the monasteries of Tsurphu and Yangpachen north-west of Lhasa. Some treks off the beaten track originate from the remote Karta Valley just north of the Himalayan giants of Makalu, Lohtse and Everest. ♦ 04 days - One option is the lovely trek along the Doya Ri. ♦ 10 days - An exceptional encounter takes you from Karta into the amazing Kang Shung Valley, right below stunning Makalu and in sight of Lohtse and Everest. ♦ 15 - 21 days. Sacred Mt. 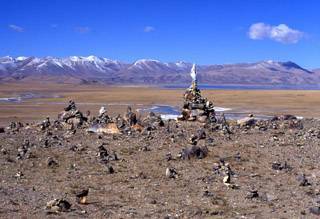 Kailash is situated in the extremely remote western Province of Ngari. Worshipped by 4 religions and seen as the mystical centre of the world. A unique physical challenge, a circumambulation of this magical mountain on the 3 day Kora, conquering the Drolma La 5750m. A look inwards at the shore of otherworldly Lake Manasarova. Possible extensions are a visit to Tathapuri and a dive deep down into the grand valley of the Sutlej at Tsata/Tsaparang, once the centre of GuGe civilization. ♦ 17 - 25 days. Sacred Mt. Amnye Machen, the Ancestral Mountain of the Golog Tribes, is situated in the far east of the country where Amdo and Kham meet. Stunning views of this amazing mountain range on a 9 day Kora /circumambulation. This trip includes visits to the monasteries of Kumbum and Labrang, the two largest Buddhist monasteries of the Gelugpa order in Amdo, an excursion to Lake Kuku Nor, the largest salt lake on the plateau, as well as the renowned Rebkong school of Buddhist art. Another side of Tibet. ♦ 17 - 22 days. Mt. Minyag Gangkar (7550m) in Kham is a centuries-old pilgrimage site. Tibetans from the entire plateau congregate here to pray and accumulate merit by walking the Kora (about 12 days). A single night spent around Mt. Minyag Gangkar equals 10 years of meditation at home, locals say. Access is from Chengdu in Sichuan Province along the Sichuan-Tibet highway. ♦ 11 - 18 days. Chengdu - Lhasa via Kham. An adventure through the mountains of the Chinese province Sichuan high up to the Tibetan Plateau and into distant Lhasa in Central Tibet. The classic route from China to Tibet via Kham region with all it's delights and challenges. ♦ 13 - 20 days. Lanzhou - Lhasa via Amdo. Starting off in the Chinese province of Gansu and crossing Qinghai (Amdo) on the way to Lhasa. Visiting enroute many fascinating places like Labrang monastery (birth place of the current Dalai Lama), Kumbum monastery and passing by Tibet's largest salt lake Lake Kokonor. Be guest of the nomads. ♦ 18 - 28 days. Lhasa - Kashgar. A journey through the remote western parts of Tibet into the steps and deserts of Central Asia, inhabited by Turk people. Traveling the southern Silk Road to the bazaars of Kashgar, the old trading post north of the gigantic Karakorum Range. Outside of Lhasa a Tibetan English-speaking guide is necessary. In Lhasa you can get along without him, if you prefer to organize all visits and tickets yourself and look for a guide on spot. Transport is usually by Toyota Landcruiser, and drivers don't speak English.